From space, the amount of atmospheric trace gases can only be measured by interpreting spectral features of light emitted or reflected by the Earth atmosphere. On its way through the atmosphere, at certain wavelengths light gets absorbed by atmospheric trace gases and the depth of the absorption lines in the reflected spectrum provides information about its atmospheric abundance. This technique is called atmospheric remote sensing. Figure 1 shows an example of an atmospheric transmission spectrum at around 1.6 μm and the contribution of carbon dioxide (CO2) and methane (CH4) absorptions. Due to the outstanding expertise of the Earth Science group in the remote sensing of CO2, CH4, CO and water vapor isotopes, SRON is involved in several national and international collaborations to exploit current and to plan future satellite measurements of these species. 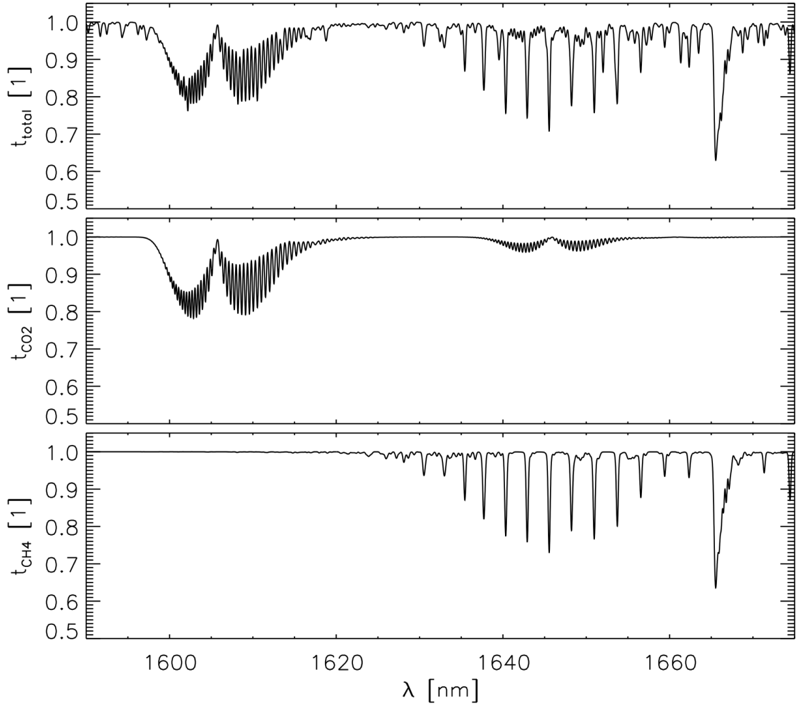 Figure 1: Total atmospheric transmission spectra in the 1.6 μm spectral range (upper panel) and the contribution of CO2 absorption (middle panel) and CH4 (lower panel). Carbon dioxide and methane are the most important man-made greenhouse gases [IPCC 2013] and hence, play a major role in climate change. Climate prediction and verification of emission scenarios, such as proposed by the Kyoto Protocol and recently by the 2015 Paris Climate Conference COP21, requires accurate, geographically and temporally dense atmospheric CO2 and CH4 observations, which represents a challenge for current and future satellite instrumentation and data interpretation. At SRON, the RemoTeC algorithm has been developed to infer CH4 and CO2 total column densities from Earthshine radiance measurements in the shortwave infrared spectral range [RemoTeC development started at SRON and is now a collaboration between SRON and DLR]. Here, particular attention is given to account for light scattering by aerosols and cirrus on the atmospheric light path. 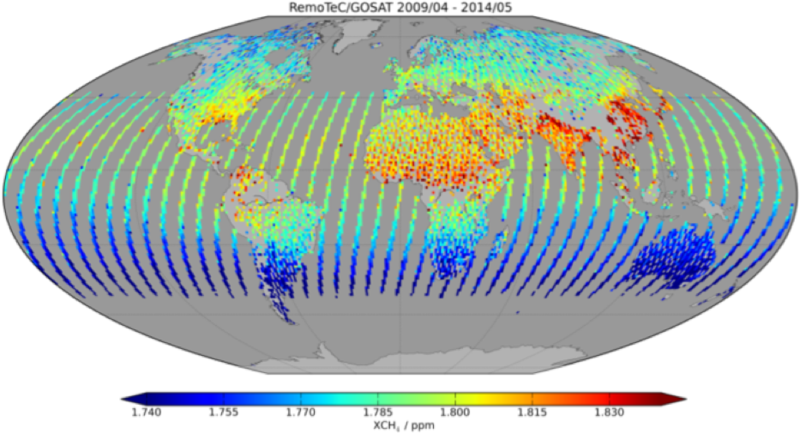 Figures 2 and 3 depict examples of the RemoTeC GOSAT CO2 and CH4 data product. The five-year average of the CH4 global distribution shows clearly the latitudinal gradient due to the strong methane sources at northern latitudes. Moreover, regional methane enhancements in south-east Asia and central Africa are assumed due to rice cultivation and by biomass burning, respectively. To assure the validity of the data product, comparison with independent accurate measurements is indispensable, as demonstrated for a time series of CO2 GOSAT measurements at Lamont (USA) and collocated TCCON ground based measurements. Figure 3 shows an excellent agreement between both data with a clear diurnal cycle due to seasonal vegetation change and the corresponding CO2 uptake. 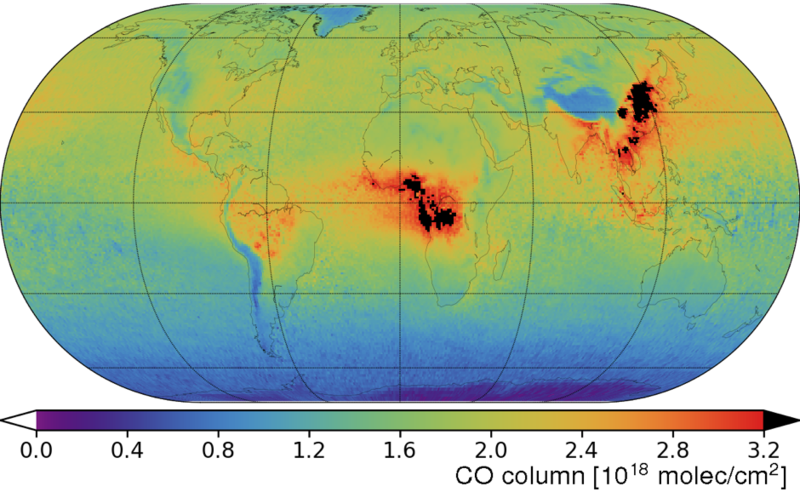 Carbon monoxide is an essential pollutant and its observation by satellite remote sensing is important for air quality monitoring and the discrimination between different combustion types across the globe. Although it is a very weak direct greenhouse gas, it affects indirectly global warming due to its reaction with the hydroxyl radical (OH) and so reduces the abundance of the main greenhouse gases. SRON developed the SICOR algorithm to infer CO total column densities from Earthshine radiance measurements in the shortwave infrared spectral range around 2.3 measured by e.g. the SCIAMACHY, TROPOMI and Sentinel-5 spectrometer. The algorithm carefully accounts for light scattering by clouds, aerosols and cirrus for an accurate CO data product. Figure 4 shows the global CO distribution of 10 years SCIAMACHY observations with enhanced concentrations in central Africa and east Asia because of biomass burning and industrialization, respectively. Water vapor (H2O) is the most abundant greenhouse gas in the Earth atmosphere. Human activites do not directly affect the atmospheric water vapor concentrations on global scales but a warmer atmosphere due to climate change contains more water vapor and so can cause a further temperature rise. This positive climate feedback likely has an impact on the global water cycle. Measuring water vapour and the heavy water isotope HDO provides deeper insight into global warming and the water cycle. Both molecules can be inferred from SCIAMACHY, TROPOMI and Sentinel-5 μm measurements using SRON’s SICOR algorithm.